Have a question about graduating this year? Take a look at our FAQs below to find out more or alternatively if you can't find your answer below, contact our Graduation Office. To register to attend – or not attend – your graduation ceremony you must complete the online Graduation Registration form. This will take you through a few steps during which you will check your name, confirm your address, indicate whether you wish to attend your ceremony and if so request the number of guest tickets you require. Whether you choose to attend your graduation ceremony or not, it is important that you complete your online Graduation Registration so that we have a correct record of your name and the address where you can be contacted until November. If you are not attending and we do not have your correct address details, you may not receive your certificate. This is also your last opportunity to correct any misspelling of your name. From August onwards, invitations to graduation will be sent to students who have completed their studies and had their award agreed by an Assessment Board. In order to be eligible to attend the 2018 graduation ceremonies, an award will need to be agreed by an Assessment Board by Friday 14 September 2018. If you have had your final results letter and not received your graduation invitation by mid-September, please contact the Graduation Office. Registration will open in August and the link to the online Graduation Registration form will appear in O.A.S.I.S. > Graduation Registration when we send your invitation. Please note that you will not be able to see this link until we have sent this invitation. Your invitation will be sent to your personal email address held on your record as well as to your University email address. For your reference, a copy of your invitation can also be found in your Correspondence History in O.A.S.I.S. All graduating students must wear the correct academic dress for their award. All graduands will wear a black gown, black mortar board and a hood. The hood colour and style of the hood will depend on the level of the award that you are due to receive and the awarding institution. Students graduating with a University of Suffolk award will wear the new University of Suffolk academic dress, and students graduating with a joint UEA/Essex award will wear the academic dress. Graduands who wish to wear the traditional dress of their country are allowed to do so but this must be worn underneath their academic gown. Graduands who wear a turban will not be required to wear a mortarboard. Please remember that the graduation ceremonies are a formal occasion and students are expected to dress smartly. Gowns must be hired (or purchased) at least two weeks prior to the ceremonies from Ede & Ravenscroft, the official gowners, either online at www.gownhire.co.uk or by telephone on 01223 861854. You are advised to order your gown online if possible in order to receive a discount on the price. As a guide, when ordered online undergraduate gowns cost £45 and postgraduate gowns cost £51. If you choose to order by telephone, the gowns will cost an additional £5. You will not be able to order your gown until you have completed your online graduation registration form and we have confirmed you are eligible to attend your ceremony. Within three working days of you registering to attend your ceremony, your student ID, name, award type, ceremony date and ceremony time will be supplied to Ede & Ravenscroft for gown ordering purposes, and you will be sent an email confirming that you can now order your gown. By providing these details to Ede & Ravenscroft, the correct academic dress for your award will be automatically selected for you when you login to the Ede & Ravenscroft website to order your gown. You will be asked to confirm that you accept the sharing of this data when you complete your registration form. If you have any questions or concerns about the data being shared, please contact the Graduation Office (graduation@uos.ac.uk). Once ordered, gowns will be available for collection at the venue on the day of your ceremony. Ede & Ravenscroft Ltd have been appointed official photographers for the University of Suffolk graduation ceremonies. They will have several studios at the graduation ceremonies and will be available before and after each ceremony for student and/or family portraits. Prices for photographs vary depending on the chosen package. As a guide, the basic photography package costs £30. If required, your chosen package can be pre-ordered directly from Ede & Ravenscroft when you order your gown or you can purchase a package on the day of the ceremony. Further details of the packages available can be found on the E&R photography flyer. An Ede & Ravenscroft photographer will be at the graduation ceremonies taking a photograph of every graduate as they cross the stage to have their award conferred. Photographs are available to view and purchase through the E&R Online Gallery usually 7-10 days after the ceremony. There is no obligation to purchase any of these photos. If you are attending one of the ceremonies in Ipswich or Bury St Edmunds, Ede & Ravenscroft will have a display stand after the ceremony where award photographs can be viewed, purchased and printed on the day. Further details can be found on the E&R award presentation photography flyer. The names of all graduates, including those conferred in absentia, will appear on a range of “Class of 2018” t-shirts, baseball shirts and hoodies produced by Campus Clothing. If you do not want your name to appear on the graduation clothing range you must opt out during the online graduation registration process. Campus Clothing also offer a range of other graduation memorabilia including teddy bears, mugs and loungewear, some of which can be personalised. 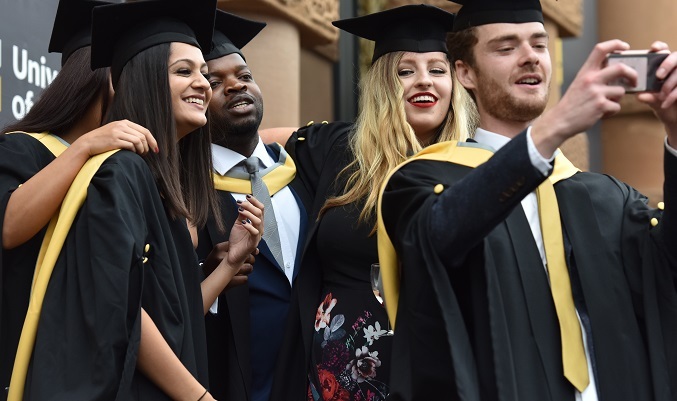 To view the full range of graduation memorabilia available from Campus Clothing, please visit their website and enter ‘University of Suffolk’ in the institution box. All items can be purchased online. Alternatively, if you are attending any of the ceremonies in Ipswich, Campus Clothing will have a stand at the venue on your graduation day where you can view and purchase various items. All of the graduation ceremonies in Ipswich will be recorded and a souvenir copy available to take home on a USB key or DVD, after the ceremony. Personalised 1 minute eVideos and digital downloads of the ceremonies will also be available. Place an order now.